There's no better place than Itaewon to experience a little slice of Korea's take on the rest of the world. If Ban Ki-Moon had to choose a place in Seoul to move into after returning from his position at the UN, Itaewon would be an excellent option. Like Singapore’s Clarke Quay and London’s Soho, Itaewon is Seoul’s epicentre for all things international, especially if you’re on the prowl for food. From Korean coffee shops to dog cafes and soju bars, the options are endless. Dining options are also limitless here, where you can find traditional Korean BBQ joints occupying spaces next to Pakistani curry houses. Itaewon also hosts the world's largest Line Friends store, if you're into that. Apart from these, there are also a few iconic places that really set Itaewon apart (from places like Hongdae) as a bastion of innovative retail and lifestyle concepts. As mentioned, Itaewon has countless lively (read: over-frequented) cafes and restaurants that have been more than adequately covered by others and therefore I’ll spare myself by skipping over such locations. However, I would like to present a simple selection of three stand-out locales worthy of a visit for the more laid-back and discerning traveller. Anthracite is an ambitious interpretation of what the modern coffeehouse should look and feel like. Paying homage to its humble origins as a roastery in an industrial district, Anthracite’s overall design concept is utilitarian and strikingly simple. It is not common to see a cafe that has such a unified approach to design especially when one compares Anthracite to Seoul’s other cookie-cutter cafes (read: Seoul's cat and dog cafes) and is probably of Korea's best coffee roasters. This approach to design is further complemented by its experimental interior decor choices like the massive green centrepiece on the second floor and the eclectic rope display on the third. If the goal of the cafe was to spark creativity in its patrons, Anthracite’s layout is a masterstroke. For those more inclined to soak in the bustle of Itaewon, an outdoor seating area is also available for those indulging in a pick me up. Anthracite proudly shows off its in-house roasting process which is laid out in clear view on the cafe’s ground floor. This blend of sights, smells and sounds undoubtedly creates an all-enveloping experience for coffee enthusiasts, which can be further augmented by the cafe’s curated selection of light bites. Anthracite’s baristas are also masters in their field; with a passion for and readiness to recommend their variety of brews to customers. There’s nothing much to say about its coffee other than the fact that it is excellent. The same can be said about the cafe’s wide selection of beans which can be brewed on demand or bagged for later consumption. To this end, both fans of bitter brews and sweetened coffees will find Anthracite a refuge from a city that is crazily obsessed with soju and after visiting will find it an interesting interpretation of modern Korean coffee culture. 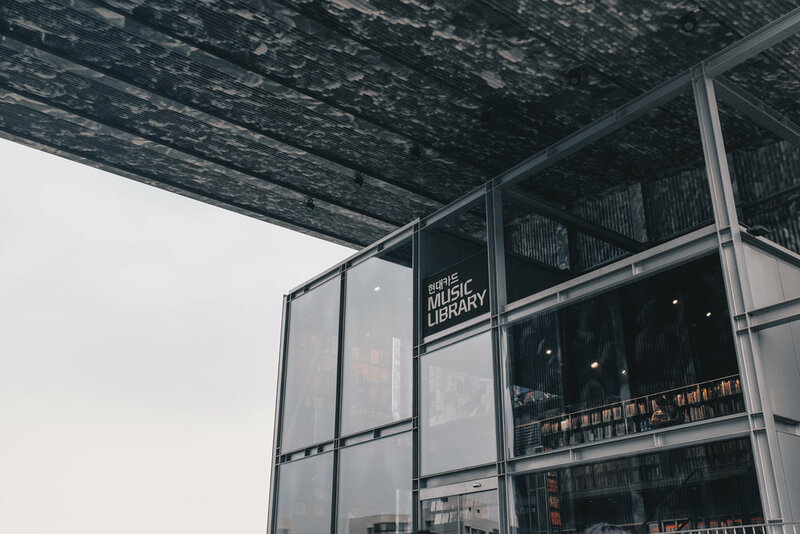 Closely adjacent to Anthracite, the Hyundai Card Music Library is yet another establishment where people congregate at along Itaewon-dong. The library sits at the tail end of the street close to Hanggangjin Station which does record less footfall as compared to the area surrounding Itaewon station. The decision to locate the library here however, seems to be deliberate as the premises acts as an oasis from the din of the main street. The grand facade of the library also serves as another compelling reason to visit. Unfortunately, access to the library’s repository of records and tracks (with its limited edition collections) is limited to holders of the Hyundai credit card. However, one can pop into the adjacent *Vinyl & Plastic* if one wishes to browse and purchase contemporary albums that have been reproduced in vinyl. Nevertheless, the common (read: open access) area of the library consists of the outdoor sitting area and a small indoor one which is replete with bean bags. Both areas are conducive for reading and chatting but the outdoor section is favoured by fresh air and the occasional breeze. Before I visited, I didn’t know that the library was built for the purpose of attracting card signups. Which other card company can boast of having every single Rolling Stones issue and also limited edition versions of Beatles records? So on hindsight, I think that the library is quite an innovative tactic to draw people in and I wonder whether we will actually see such ventures being commissioned in Singapore. The Leeum Museum of Art is also another chaebol enabled cultural venture worth checking out in Itaewon, featuring two sections each dedicated to traditional and modern art. Of the latter, ‘Medicine Cabinets’ by Damien Hirst stood out as an interesting critique of art’s place in human society. 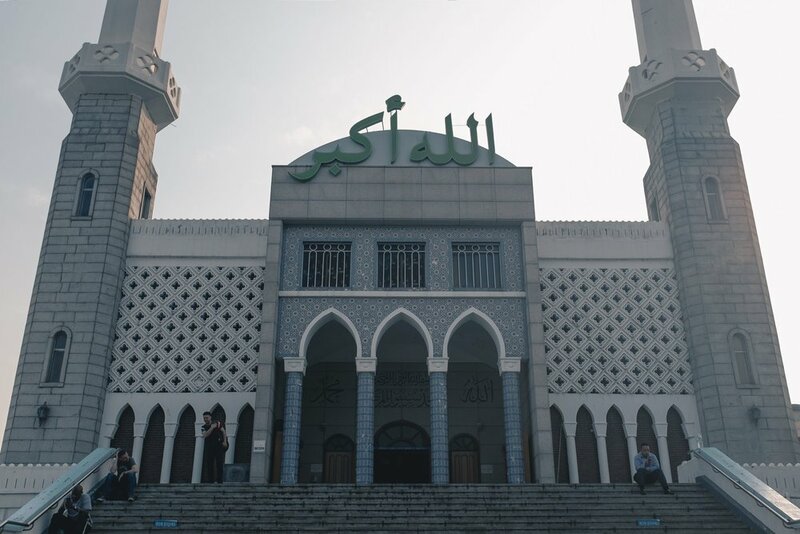 The liberal atmosphere of Itaewon makes it an ideal home for religious institutions and it is for this exact reason that we find the Seoul Central Mosque flourishing ever since its opening in 1976. Despite South Korea being overwhelmingly Christian or Buddhist, the Seoul Central Mosque (with its towering minarets) organises prayers and lectures unhindered and thus is indicative of the country’s commitment to religious tolerance. As a result, this has facilitated an almost two-fold increase in the country’s Muslim population since 1990; a remarkable feat in itself until you find out that its neighbour to the North recorded 300% growth. In any case, the mosque perhaps is an Islamic version of the proverbial city upon a hill. The mosque’s daily devotees number in the upper hundreds and whilst visiting, it was clear to me that the faithful are more than willing to routinely trek up the hill to attend prayers. Who could fault them? The view overlooking the district is quite a calming sight even if it includes some of Itaewon’s more seedy and unsavoury night-time establishments. Despite getting weird looks for going in shorts (hey it was summer), I managed to get a nice shot of the mosque’s facade and had a nice chat with an Australian travel photographer whilst observing people stream into the compound. My first encounter with Itaewon didn’t charm me - it felt just like any other city’s designated clubbing district with nothing else to offer. However, after returning three days later, my perspective on what there's to do in Itaewon has changed. PS: It's more than the Line Store.